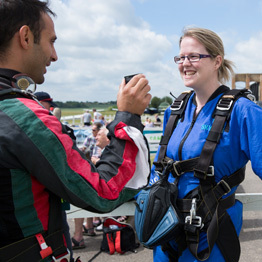 A tandem skydive gift voucher is no ordinary gift! Perfect for those people who prefer adventure and experiences to traditional gifts – from just £49. 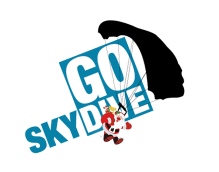 Skydive vouchers make the perfect gift. Buy now from just £49. Salisbury has a main line railway station with trains direct from London, Oxford, Bristol, the South Coast and the West. 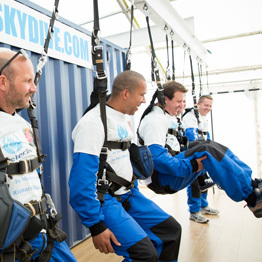 GoSkydive is just a short taxi journey (10 mins) from the Salisbury station. Plan your train journey. Am I too old or too young to jump? Our oldest jumper to date was 95 years old – so age isn’t a boundary for us if it isn’t for you. As long as you are reasonably fit and healthy then you should be OK to tandem skydive with us. On the day you’ll need to declare your fitness by signing a declaration form. You can view the form here. You need to be at least 16 to do a tandem skydive, if you are aged between 16 and 18 you will need a parent or legal guardian to sign to give their consent. Download the form to be signed. Do I weigh too much to jump? Weight-wise 15 stone or under is the general rule but if you’re reasonably fit and under 18 stone we are happy for you to jump with us. However, just like every other jumper you will be assessed by a highly qualified tandem master on the day of your jump, should he have any concerns about your ability to manoeuvre into any of the required skydiving positions you will not be able to jump. Due to higher operational costs there is a charge for any weight in excess of 15 stone. 15-16 stone £10, 16-17 stone additional £20, 17-18 stone additional £30. I have a medical condition - can I still skydive? No matter what your age or your weight all jumpers will be assessed on the day of your jump by a tandem master. If he is not satisfied that you can manoeuvre into the required positions during freefall you will not be able to jump. What are the freefall and landing positions? On exit you’ll need to be able to tip your head back and arch your back whilst tucking your legs up behind you. Your arms will need to be crossed, into and across your chest. During freefall you will uncross your arms and bring then up in front of you. As you come into land your instructor will tell you to lift your legs, you need to be able to lift your feet up to knee level whilst in a seated position. You will be able to use the fabric on the sides of your jumpsuit to assist you. 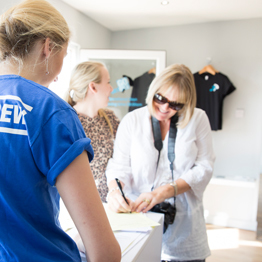 We’ll supply you with a jumpsuit, goggles and a leather hat for your tandem skydive. In addition you’ll need to wear trainers or similar sturdy footwear and comfortable clothes. If you are jumping outside of the high summer months or it’s a cool day ensure wearing some nice warm layers and some gloves. Tandem skydiving is a weather dependent activity therefore it is almost impossible for us to predict how long you will need to allow for your skydive experience. At 5pm the day before your jump we will have a more accurate view of the weather for your jump day and will advise you accordingly and keep you updated, however the weather is very changeable and therefore we advise you allow the whole day for your tandem skydive experience. What about my fan club? It’s great if you can bring friends and family along to support you. Old Sarum Airfield provides plenty of free on-site parking, and has a café on-site serving hot and cold food, with lots of seating inside and picnic benches outside. Supervised children are very welcome, however, because your skydiving visit may take all day and can get busy, it is unsuitable for dogs and bikes. The Airfield does not allow ball games or radio-controlled toys. I need to change the date of my jump. No problem, as long as we have 7 days notice and your new date is within a year of your booking date there is no charge to move your jump date. Less than 7 days and there is a £30 fee. Over a year from the original booking date and the validity has expired. What is tandem skydiving weather? Tandem Skydiving is a weather dependent activity and for your safety we can only jump when the weather conditions are suitable. We need a nice clear day with low wind levels and minimum cloud cover. How and when will I know if the weather is suitable? Is it safe to tandem skydive? Like any extreme sport, tandem skydiving does have risks attached. At GoSkydive your safety is our number one priority and that is put above everything else. We are fully regulated by the British Parachute Association (BPA) and we follow their guidelines. On site our Chief Instructor (CI) ensure the BPA guidelines are adhered to at all times. We use the very best, industry leading parachute technology – the Sigma Tandem Parachute System and have a core team of full time professional tandem skydive instructors who collectively have done in excess if 50,000 jumps. More information about risk is given on the student declaration form which you’ll need sign prior to tandem skydiving with us. You can view the form here. If you’re thinking of having a few drinks to calm your nerves – please don’t. Anyone believed to under the influence of alcohol or drugs will not be permitted to jump. If you’d like to have a drink to celebrate post jump we are happy for you to do so. Smoking is permitted in the designated smoking areas if you are not wearing a skydiving jumpsuit or harness. Anyone wearing any GoSkydive kit is not permitted to smoke. I have one of the medical conditions listed and my GP won't sign the form / has more questions about skydiving before he'll sign. If your GP has further queries he/she can telephone the BPA Medical Advisor for more advice. Details for the medical advisor are available through the BPA. You can find more information relating to the medical form here. Can I film my own jump? Is this actually a skydiving centre? 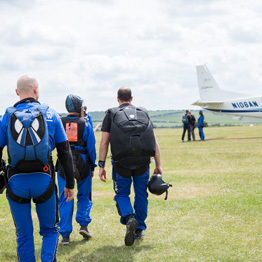 GoSkydive is based at Old Sarum Airfield, Salisbury and is the UK’s only specialist tandem skydive centre in the UK. We’re not a third-party seller. Are you well reviewed by customers? Yes! 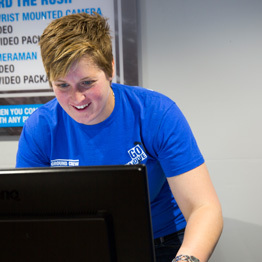 We are the UK’s top rated tandem skydiving centre – we’re not just saying that. Check-out our TripAdvisor and Facebook reviews. Do you do every kind of skydive or focus on one? Tandem? Solo? We are the UK’s only specialist tandem skydive centre – we are not a skydiving club, we do not have sports jumpers here. The only people we deal with are first-time jumpers and we are specially trained to work with first time jumpers – they are our one and only priority. We are the only centre in the UK to only work with first time tandem jumpers. This is my first time jumping, will I receive any training beforehand? 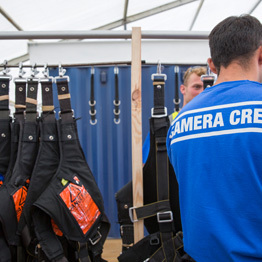 Yes, we have a simulated training area where students are suspended in their harness to go through the plane exit, freefall and landing positions – we are the only skydiving centre in the world to have this facility. The alternative is laying over a 3ft high box and lifting up your arms and legs. We use industry leading United Parachute Technologies Sigma Tandem Parachute System. The parachute container (which looks like a back pack) houses the main parachute and a reserve chute. The main parachute is packed on site by our own team of packers. The reserve chute is packed by an industry approved specialist team off site. Our Cessna Super Cargomaster is the fastest tandem skydiving aircraft in the UK and will get you to your jump altitude in 8 -12 minutes. Refitted to our specific tandem skydiving requirements, this aircraft was new to our fleet in May 2015. It takes up to 21 passengers but reaches its top speed, climbing to 3000ft per minute, with just the pilot. What options do you have for capturing the skydive? Filming with a GoPro camera from 15,000ft at 125mph is a highly skilled operation and only those instructors who are jumping regularly and have a minimum of 500 tandem skydives as a tandem instructor are permitted by the British Parachute Association to do this.